Posorbis cloud-based Solution have apps with live sales data at your fingertips. Restaurant POS systems assist businesses to track transactions in real time. POS refers to point of sale (POS) software that runs on computers. Events POS gives you a totally automated system, control over events planning. Has a flexible, customizable and extremely easy-to-use interface. Multilingual websites, a necessity for businesses and organizations. A restaurant website, an important role in the restaurant’s marketing mix. A hotel website is the central hub of all your internet marketing activity. CRM is an information industry term for methodologies, software. CMS is a computer software system for documents and other content. Posorbis, a brand new, FREE Mobile (Home) Phone or Web Portal. Posorbis simplify by connecting restaurants and consumers. A set of sample demo given below help you get familiar with the features. API provides a flexible, powerful way to access your favorite content. To connect and communicate with personal and professional network. IVR is a technology that automates interactions with telephone callers. A payment gateway enabled merchant to process transaction. e-Biller is a fast, powerful and accurate web based billing solution. Account Level Billing is primary level of hierarchy e-Biller supports. Architecture provide a wide flexibility for system setup. Capable of billing from a consumer to big corporate client under one roof. POSOrbis is an India based IT company. Learn POSOrbis Management Team, leadership credentials and more..
Controls, ability to deliver practical, cost-effective and strategic solutions. You're always within easy reach of our friendly, knowledgeable staff. We've recently reorganised our site map and services page. Now a days with a near omnipresent of the mobile phones, it forms a very important, indeed essential means for the people to connect and communicate with their personal and professional network. Extending the email network to the mobile phone therefore makes imminent sense. However, most approaches to enable email access on the mobile phone have been constrained by the need for special devices and services.The system also supports advertising and marketing features wherein the user can send mass emails and mass SMS messages. This offers a cost effective means of contacting your customers and provides the ability to personalize each message based upon your requirements and also faster, easier way to extend the enterprise email network to include the mobile phones, with immediate benefit to productivity and responsiveness of an enterprise. 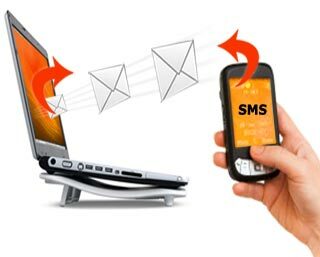 Send SMS messages from your email account. Users essentially send emails which are converted to SMS and sent using either a GSM modem or an SMS Center as a gateway. Receive SMS alerts for important email messages. Users can configure alerts to be sent to their mobile phones, based on mail filter rules, e.g. send an alert with a summary of the mail, whenever the user receives a mail from alok@posorbis.com. Send email message using SMS. While travelling, if a user does not have access to a PC to access the email client, he could send a small email using the SMS as a carrier. Configuration/Settings for switching some of the features on and off to make the application generic for different types of restaurants. Generate reports for data analysis. Overbooking and automatic priority calculations based on historical data. Making blue-prints or layout of the floors, sections, etc. Reservations through SMS besides phone and walk-in customers. Choose between GSM modem and SMS Center services. This platform enables a whole new set of applications and also increases the efficiency of the work force. Copyright © 2016 Posorbis IT Solutions Pvt. Ltd. All rights reserved. Telecommunication billing solution, software development india, call accounting, outsourcing from india , web application , hotel billing, call billing, phone billing software, web based billing software, Online food ordering system, Online Restaurant, Online Menu, Restaurant management and ordering system.